San Jose opened its 25th library location April 8 and the first “bridge” library for residents who live at least two miles from the closest city branch. Mt. Pleasant Neighborhood Library will have the system’s first-ever laptop checkout program, bilingual programming, homework clubs, coding classes and story times, in addition to regular library services. The Mt. Pleasant Elementary School District offered up a 2,200-square-foot site about two years ago and began the process of creating a mini library on the city’s eastern edge. The project became a reality with a $200,000 grant from nonprofit Sunlight Giving. The main purpose of the “bridge” library idea, which is its pilot stage, is to improve educational access within walking distance for those who rely on public transportation or only have one car. The next-closest libraries are the Hillview and Evergreen city libraries, which can be difficult to access for parents. Students from neighboring schools rushed into the small building after the ribbon-cutting, plopping down on colorful chairs and grabbing books for an afternoon of browsing. One preschooler named Pablo, who hadn’t yet learned how to read, flipped carefully through “Pete the Cat and His Magic Sunglasses” and assessed its colorful photos, while teenagers from the nearby August Boeger Middle School gathered around the laptop checkout console across the room. Charlotte, a sixth-grader from a charter school, was late to the opening because she was wrapping up her first novel-writing class. 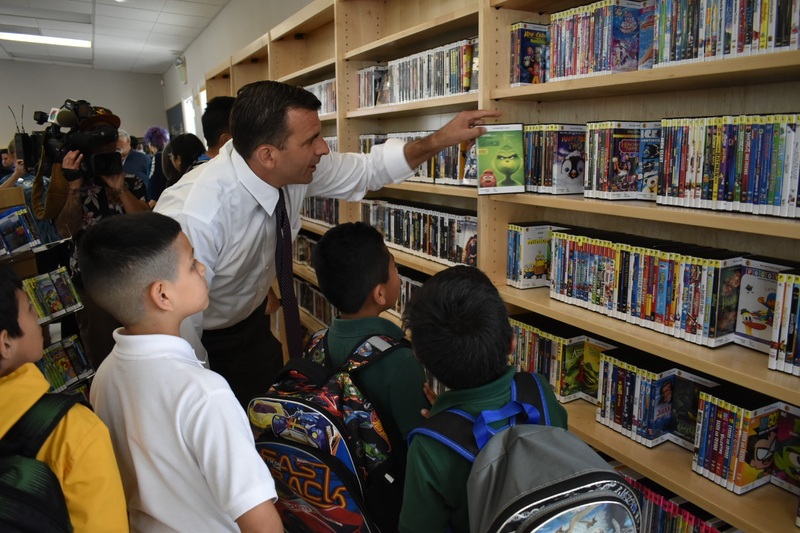 After taking a close look at the laptop loan system, Mayor Sam Liccardo pulled out a DVD copy of “The Grinch” from an extensive movie collection and presented it to a group of curious grade-schoolers. In a speech to residents, Liccardo said libraries have never been more relevant, despite Google’s enormous influence in information-gathering. He said 509,333 city residents have library cards and the number will grow with the city’s latest addition to the library family. The building used to be a community center for neighborhood association meetings and private events, like birthday parties and bridal showers. School board President Robert Perez, who has lived in the neighborhood for about 40 years, hopes it will see even more use as a library, especially by providing access to online adult education. “Our hopes are always to make it bigger, if it’s possible,” Perez said. The library will change out offerings based on interest, and work with the community to offer specialized programming. The Mt. Pleasant Neighborhood Library will be open from 2 to 6 p.m. Monday through Thursday, 9 a.m. to 1 p.m. on Friday, and 10 a.m. to 2 p.m. on Saturday. The library is at 3411 Rocky Mountain Drive in San Jose.